A flying boat dropped Paddy Sherman’s mountaineering expedition at Lituya Bay on June 17, 1958. Over the next three weeks, the climbers made the second ascent of Mount Fairweather, a first ascent of an unnamed peak, and had come within 200 feet of the first ascent of Mount Lituya. When hot weather made glacier travel untenable, they returned to Lituya Bay and radioed a request to be picked up on July 10. Lituya Bay offers the only sheltered anchorage for a long stretch of Southeast Alaska coast, but the bay itself is hardly safe. Cenotaph Island, a large wooded mound at the center of the bay, is named for the 21 members of the La Perouse expedition who drowned in 1798 after capsizing in the tidal bore at the bay’s shallow entrance. In the 1950s, a sturdy cabin on the island served as a sometime base camp for Don Miller, a geologist who had taken an interest in Lituya Bay’s other great hazard. Distinct trimlines—demarcations in the vegetation with young growth below and old growth above—showed where unusually large waves had torn through the bay and run up hillsides as high as 490 feet. Miller believed he had identified four such waves over the last century, but he did not know their cause. The mountaineers’ pilot came early, on the evening of July 9, forcing a mad scramble to leave before nightfall. By 9pm they were in the air, leaving behind three fishing boats that had come into the steep-walled bay for the night. The Sunmore and Badger were each crewed by married couples. Howard Ulrich had brought his seven-year-old son along on the Edrie. The earthquake struck at 10:16pm. Ulrich was awakened by the shaking and went up on deck. Avalanches were coming down the mountains at the head of the bay. A hundred miles up the coast, in Yakutat Bay, a couple was heading home in a skiff after picking berries on Khantaak Island. They felt the quake and watched as an 800-foot stretch of the island's beach disappeared into the bay along with three of their friends. In Yakutat, the earthquake damaged bridges and docks and knocked a water tower to the ground. Two hundred miles to the south, underwater landslides in Lynn Canal severed ACS's Juneau-Skagway cable in four places. 11,300 feet up Mount St. Elias, another group of climbers felt the ground moving in waves as avalanches pounded down the slopes around them. Nine days later, descending after a blizzard suffocated one of the men in his tent, the survivors found the landscape of snow and ice deeply altered, and no sign of the lower camp where they had cached their snowshoes. The magnitude 7.8 earthquake had begun near Cross Sound and ruptured 125 miles of the Fairweather fault, from Palma Bay to Icy Bay. It was felt from Seattle to Whitehorse, though most of the structural damage was confined to Yakutat. All five deaths occurred in the water, which speaks to the nature of earthquake hazards in Southeast. The Fairweather fault does not produce the largest earthquakes, but the danger from these earthquakes is increased by the combination of steep slopes, unconsolidated soils, narrow fjords, and a population that lives and works by the sea. The Fairweather fault runs directly through Gilbert and Crillon inlets, which form the crosspiece at the top of Lituya Bay's distinctive "T" shape. During the earthquake, the southwest side of the inlets moved about 20 feet northwest relative to the opposite shore, on the other side of the fault. After a minute or so of shaking, Ulrich heard a great roar from the head of the bay. This was followed by an explosion of water in Gilbert Inlet, which gave birth to a wave that Ulrich described as “the smallest part of the whole thing” even though it was at least 100 feet high. The Wagners on the Sunmore reacted first, raising their anchor and making for the entrance of the bay. As the wall of water rushed down the inlet, Ulrich found that that his anchor was hopelessly stuck. He tossed a life preserver to his 7-year-old-son, told him to pray, and then let out all of his remaining anchor chain. After a minute or so the wave reached Cenotaph Island, breaking as it came around the left side but smooth-faced on the right. Ulrich steered into the wave and the Edrie shot up its face, snapping the anchor chain and sending it whipping around the pilot house. The boat rode over the crest of the wave, down its shallower tailing side, and was carried by a returning wave towards the center of the bay. Somehow the Edrie was still afloat with its motor still running. Nearer the mouth of the bay, at Anchorage Cove, the wave picked up the Badger and threw it over the spit. Bill Swanson described his boat lodged bow-first near the crest of the wave, as if surfing it backwards, as he looked down at treetops far below him. The boat crashed down and foundered on the far side of the spit, but Swanson and his wife Vivian were able to escape the wreck in their skiff with just the clothes they were wearing and a chair for a paddle. The Edrie, meanwhile, was caught in a mess of disordered, 20-foot chop filled with ice and logs. As the waves calmed, Ulrich piloted through the debris and made a harrowing escape through the shallow entrance at around 11pm. A little after midnight, a boat responding to Ulrich's mayday calls found and rescued the Swansons. The Sunmore had vanished, and the Wagners were never found. Don Miller, the geologist, was on a USGS barge in Glacier Bay when the earthquake struck. The barge heaved, and Miller watched as rocks fell from high cliffs into the bay. In the morning, he learned of the disaster in Lituya Bay and chartered a float plane to take him there. They flew over rafts of logs fanning out in the open water as far as five miles from the mouth of the bay. Once over the bay, they could not land because its entire surface was strewn with tree trunks and giant blocks of ice. Miller wrote that the hillsides were dripping with water while the streams that drained small lakes above the bay were running down in swollen torrents. 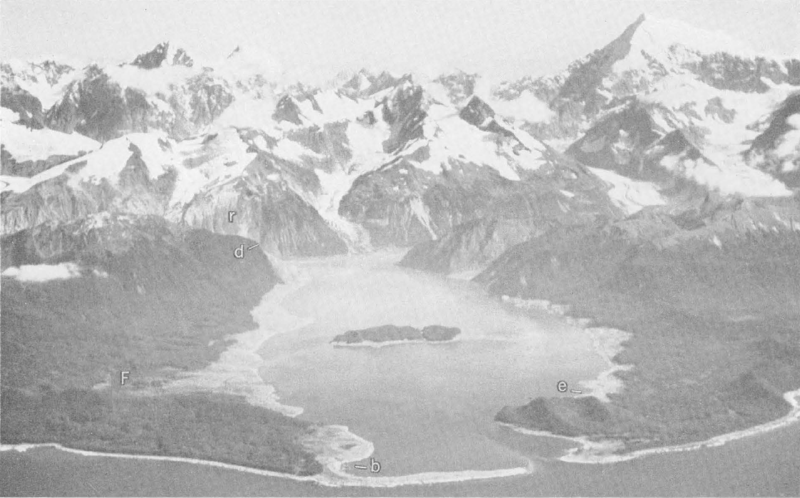 In Gilbert Inlet, which branches north at a right angle from the head of the bay, Miller found that a stream delta had vanished and 1,300 feet of ice had sheared off the end of Lituya Glacier. Up on the northeast wall, Miller spotted a huge landslide scar with cascades of rock still running down it. Opposite this scar, on the spur that forms the corner between Gilbert Inlet and the main part of the bay, pilot Kenneth Loken flew alongside a sharp new trimline below which the trees and earth had been stripped away to clean bedrock. Incredibly, the altimeter read 1,800 feet—1,300 feet higher than the 1936 trimline. When Miller returned to study the effects of the wave, he measured the highest trimline more precisely at 1,720 feet. For most of the bay, destruction below the trimline was absolute. Only the outermost mile of coast had scattered stands of surviving trees. The lighthouse at Harbor Point and the cabin on Cenotaph Island were both gone without a trace. The site of the mountaineers' camp was scoured down to bedrock. From variations in the height of the trimline, Miller inferred that part of the wave had washed over the spur while the rest of it crossed the bay diagonally and struck the south side near Mudslide Creek, creating the second highest trimline. From there it raced toward the mouth of the bay—and the fishing boats—with some side-to-side sloshing that accounted for variations in the height of the trimline along the length of the bay. To Miller, the destruction he saw was clearly the work of a giant wave, but its height seemed unbelievable. Miller wrote that his observations were "widely doubted both on theoretical grounds and on the basis of aerial observations and study of photographs by others." Scientists who had not seen the effects of the wave firsthand argued that above 300 feet, the soil and trees must have slid into the bay during the earthquake. But Miller had seen driftwood and rocks strewn across the slopes at the top of the trimline, and the trees that had not been washed into the bay all lay on the ground pointing westward, as the wave had traveled. Miller could not explain how the earthquake had caused such an enormous wave, but he was certain that it had. Miller first assumed that the wave had been caused by the large movements along the fault in the inlets. 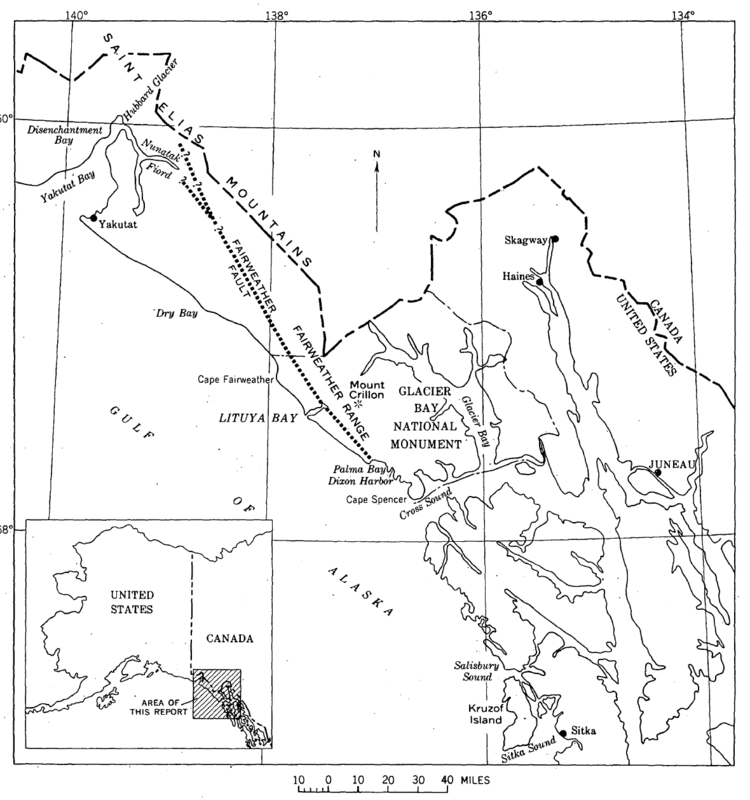 Don Tocher, a seismologist at UC Berkeley, suggested a landslide source instead, citing the horizontal movement of the Fairweather fault, the apparant radiation of waves outward from Gilbert Inlet, and the delay that Ulrich observed between the earthquake and the start of the wave. A second Berkeley researcher, R.L. 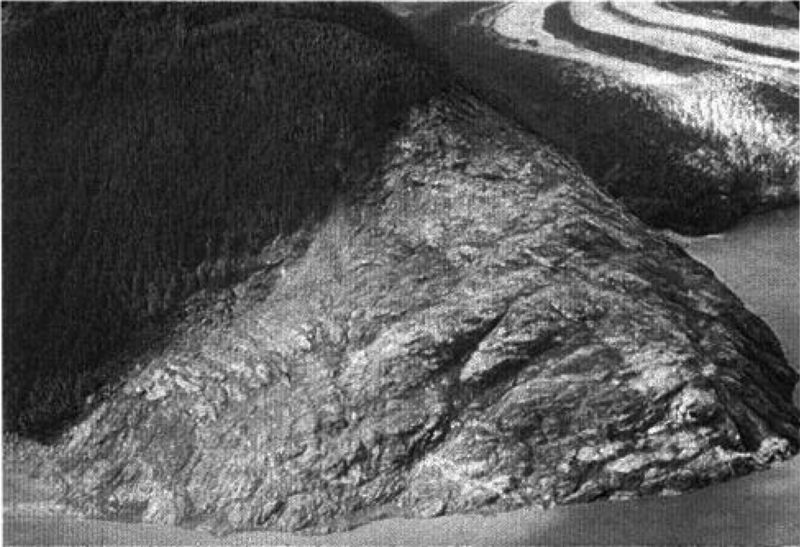 Wiegel, built a 1:1000 scale model of Lituya Bay and found that he could more or less recreate Miller's observations given a large enough mass of rocks falling as a unit into Gilbert Inlet at high velocity. 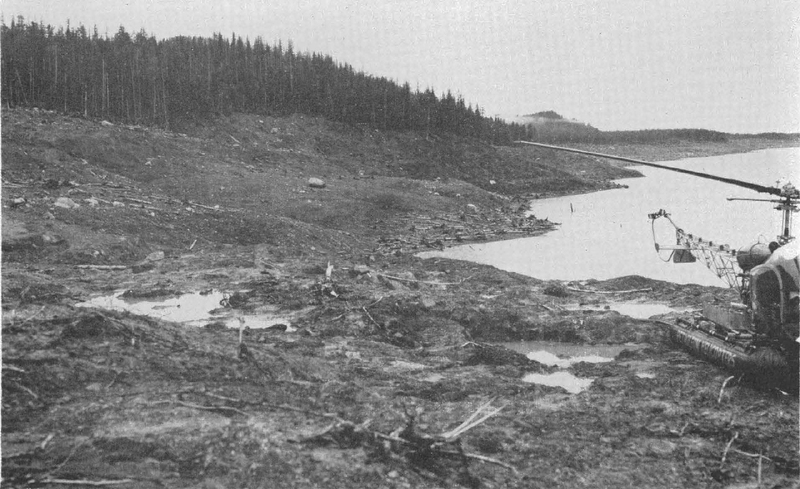 The landslide scar, which was high above Gilbert Inlet on a near-vertical slope, appeared to have dumped about 40 million tons of rock into the inlet all at once. In 2001, Hermann Fritz and Willi Hager attempted to replicate the initial wave's 1,720-foot run-up using a pneumatic landslide generator to blast simulated rockslides into at 1:675 scale model of Gilbert Inlet. Fritz and Hager found that a slide like the one at Gilbert Inlet could generate that much run-up because the rapid impact of the slide would bring a large air cavity into the water behind it, displacing far more water than just the volume of the rock. Wiegel's and Fritz's research reinforced Miller's observations as well as Ulrich's eyewitness account of the massive wave in Gilbert Inlet. However, Steven Ward and Simon Day of UC Santa Cruz felt that the Gilbert Inlet slide alone could not account for the size of the wave that swept through the outer bay or the amount of material deposited at the bottom of Gilbert Inlet. 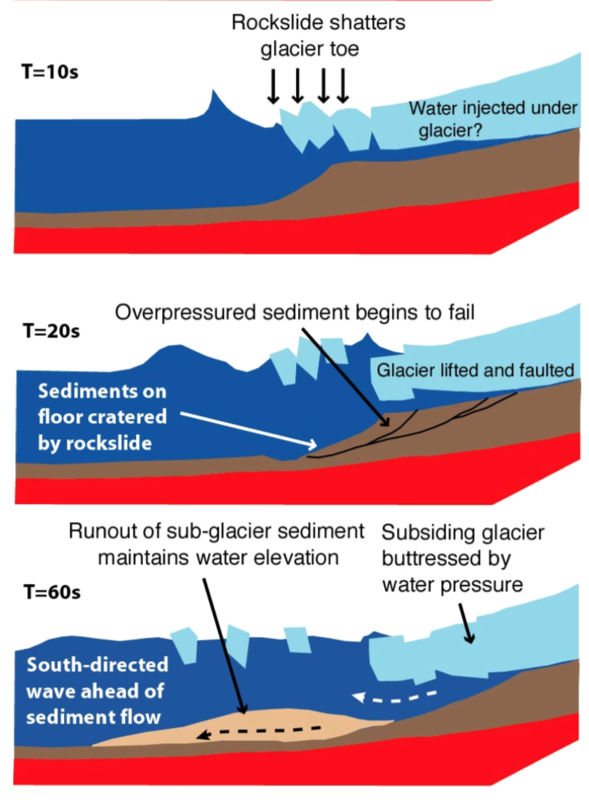 Their 2010 paper describes a possible double slide, where the destruction of the toe of Lituya Glacier triggered a much larger, slower submarine slide of glacial deposits after the initial rockslide. Proving this would require surveying the bottom of Gilbert Inlet to measure and date the layers of sediment. In other words, 60 years after the Lituya Bay tsunami, we are still working out how it happened. 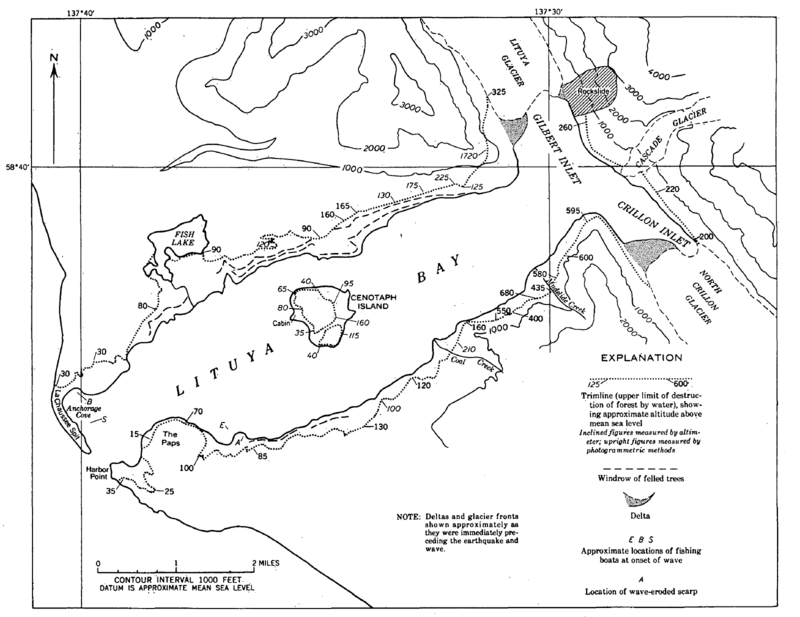 Miller's work in Lituya Bay helped to greatly increase understanding of great waves caused by landslides, which are now commonly called megatsunamis. Six years later, the magnitude 9.2 Great Alaskan earthquake would trigger landslide tsunamis across southern Alaska, accounting for many of the deaths from that earthquake. Miller was not around to study these, as he had drowned on the Kiagna River with a young assistant in 1961. Fittingly, a research vessel named after Miller served as George Plafker's base of operations for some of his work studying changes to the Alaska coastline after the 1964 earthquake--work that would greatly advance understanding of plate tectonics and especially subduction. Unfortunately, the qualities that make Lituya Bay so prone to landslide tsunamis are found in bays and fjords throughout Southeast Alaska. The combination of steep slopes rising directly out of the sea, rapid erosion from glaciers and heavy coastal precipitation, and frequent earthquakes all contribute to frequent landslides capable of causing tsunamis. It’s also possible that big landslides are becoming more common as glaciers retreat, removing support from the lower slopes of steep valleys. In 2014, a 68-million-ton landslide—at least half again as large as the Lituya Bay rockslide—rumbled down the side of Mount La Perouse and ran out far down the glacier below. In June 2016, pilot Paul Swanstrom followed a strange dust plume and found the aftermath of a more than 100-million-ton slide onto the Lamplugh Glacier. Fortunately, both of these slides ran out onto glaciers instead of into water. That was not the case in 2015, when 180 million tons of rock—the largest non-volcanic landslide ever documented in North Amerca—into Taan Fjord, an inlet of Icy Bay. Some of the material landed on the toe of Tyndall Glacier, but enough of it slammed into the water to generate a megatsunami with 600-foot run-up. Large earthquakes sometimes start the landslides that cause megatsunamis, as in Lituya Bay, but not always. 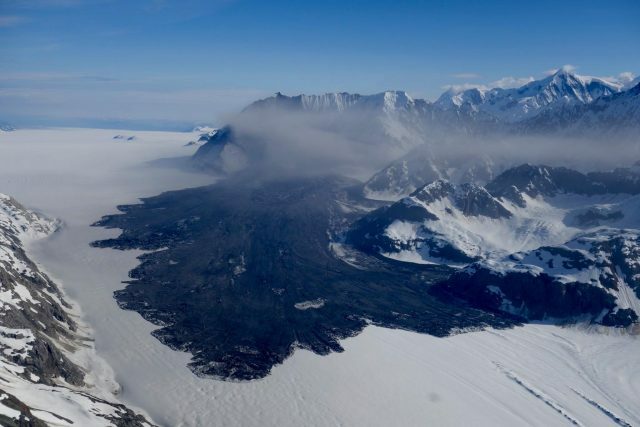 The Tyndall Glacier slide appears to have been triggered by the passing seismic waves of a distant magnitude 4 earthquake, but that was only the tiniest nudge, imperceptible to a person. The undersea slide that killed one in Skagway in 1994 was not triggered by an earthquake at all, but by an extreme low tide. So far we have been lucky to have few human impacts from recent landslide tsunamis in Alaska, but a disaster in Greenland in 2017 should serve as a warning. There, a collapsing bluff started a wave that killed four people and caused much damage in the village of Nuugaatsiaq. The landslide was not caused by an earthquake, and residents had no warning before the wave arrived. Unfortunately, landslide tsunamis are especially difficult disasters to prepare for. Usually even a megatsunami like Lituya Bay is a localized disaster, and technology-based warning systems cannot work quickly enough to help people just a few miles from the source. In Lituya Bay, fewer than five minutes passed between the earthquake and when the wave reached the boats. Slope stability assessments can help to identify potential slides before they happen, but this is expensive, and Southeast's thousands of miles of steep coastline make it impractical except in a small number of targeted locations. Education is our best tool. People living in coastal communities should understand how megatsunamis happen and what to do if they are near the water when they feel an earthquake or witness a large slide (hint: run uphill). Our tsunami inundation maps include landslide tsunami scenarios for some of Alaska's most at-risk communities, showing which areas are likely to be safe and which are not. Still, living with the danger of megatsunamis is part of the cost of working and playing in one of the world's most breathtaking landscapes. Like Paddy Sherman's climbers and the fishermen who survived the wave, it helps to be lucky. Philip Fradkin (2001), Wildest Alaska, University of California. Hermann Fritz and Willi Hager (2001), "Lituya Bay Case: Rock Slide Impat and Wave Run-Up"
Don J. Miller (1960), "Giant Waves at Lituya Bay, Alaska"
Don Tocher (1960), "The Alaska Earthquake of July 10, 1958: Movement on the Fairweather Fault and Field Investigation of Southern Epicentral Region"
Steven N. Ward and Simon Day (2010), "The 1958 Lituya Bay Landslide and Tsunami - A Tsunami Ball Approach"
Figure from Fritz and Haber (2001) showing the Gilbert Inlet rock fall and 1,720-foot run-up on the spur. Ward and Day describe how the initial rockfall could have triggered a second submarine slide of glacial sediment capable of generating the wave observed in the outer bay.